While we wait for the shortlist to be announced next Monday, members of the Shadow Giller jury are reading a few titles from the longlist. Naomi has kicked off her Giller reading with Catherine Leroux’ The Party Wall, the only translated title on the list and one which has already won a prestigious award: the France-Quebec Prize. 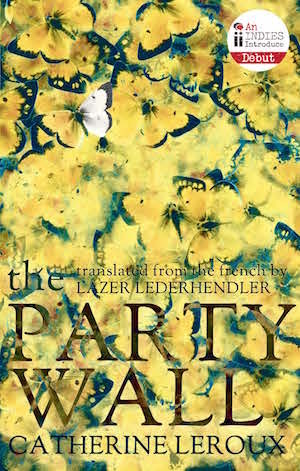 Naomi says the novel, which was translated by Lazer Lederhendler, “is more rewarding the less you know about it”— and her review, which does not give anything way, makes the case for reading creative forms of storytelling: The Party Wall is made up of interconnected stories. Connections between the stories are fun, but they’re not the only reason to read this book. The writing is wonderful. And the stories are strong enough to stand alone, or show their connection through theme; duality and siblings are strong themes in this book, in unique and surprising ways. To read Naomi’s review in full, please visit her blog, Consumed by Ink. It will be interesting to see whether this one makes the cut. Anyone else read it? Do your views chime with Naomi’s?